Agapito “Pito” Arvizu, Jr. will represent Florida at the 2018 IDEAL National Championship and have a shot at the top prize in the student/apprentice category of $30K. This third annual championship, which could be called the Indy 500 for electricians, takes place this weekend. Sponsored by IDEAL Electrical, a leading manufacturer of electrical tools, this annual race-against-the-clock competition determines the best electrical professionals and students/apprentices in North America and awards more than $600,000 in cash and prizes to the champions. Arvizu will travel to the IDEAL National Championship, all expenses paid, accompanied by program instructors and about 20 of his classmates, including Kyle Brown, who came in second in Florida. If Arvizu wins the $30,000 top prize, an additional $5,000 will go to PBSC. Second place would award him $20,000 and third place, $10,000, but no additional money for the College. While Brown won’t compete in Orlando, he’ll receive $500 to spend on IDEAL tools. The College also will bring back tool donations from the event to use in the program. Over 20,000 students/apprentices attended qualifying rounds nationwide from March through mid-October, with 700 attending in Florida alone. While not all attendees competed, the field was competitive. Arvizu, who is known as “Pito,” took the top state spot by completing the timed task in just over 53 seconds. Brown’s time was 55 seconds. 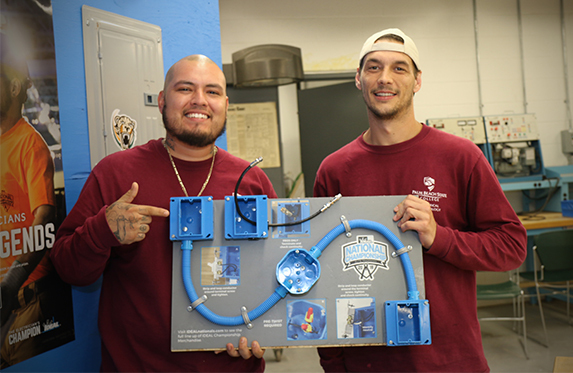 Agapito Arvizu, Jr. and Kyle Brown won first and second place, respectively, in Florida’s student/apprentice qualifying competition for the 2018 IDEAL National Championship. They hold the challenge board that all competitors had to complete. The task involved fishing, cutting and splicing wires to connect a switch to an outlet, and then performing the diagnostics to confirm the connection. The task required students to demonstrate both problem-solving and physical skills across five categories: pulling wire, cutting, stripping, termination and testing. IDEAL officials judged all qualifying rounds, and in addition to fastest completion time, evaluated wire connections, termination, connectivity and safety. Arvizu will perform a similar timed task at the national championship when he goes up against 64 student/apprentice winners from the other states and U.S. territories, as well as wild card contestants. He credits instructor Josh Colvin for encouraging him to take on the challenge of the competition. “The fact that my teacher showed me the video and allowed me to build boards in class and practice in class…it helped me to get better and better,” said Arvizu, who also helped other students learn how to do the challenge. Colvin, who came in second in Florida in the competition’s professional category, noted that Arvizu is the first PBSC electrician student to win the state and go on to the national event, which draws thousands of electricians from across the nation and Canada. Arvizu, a 2010 graduate of Santaluces Community High School in Lantana, had been working on and off as an electrical helper since he was 12 years old, often helping his uncles in the field. He realized, however, that his on-the-job experience only took him so far, and he needed formal training. 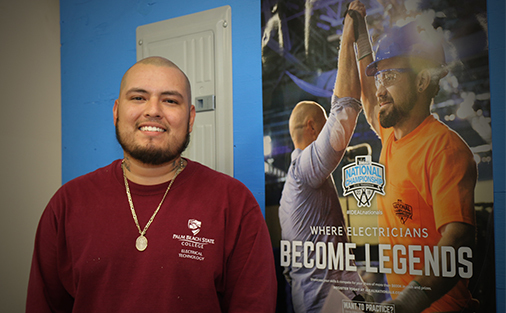 Now, as he gets ready to graduate from the yearlong certificate program Dec. 19, his goal is to become a master electrician and own his own company. He also wants to pay it forward. Great job both you and your teachers! Good Luck at the nationals!